Fanatic Barbarian Invaders in the past destroyed thousands of hindu, jain , sikh and buddhist temples. Ayodhya , the birthplace of Lord Sri Ram was also under seige.Hindus who are devoted to Prabhu Shri Ram want to have a temple at the place of the disputed structure once they were freed from the fanatics.It became controversial and communal issue so that many indian people got killed in communal riots that happened after a mob of emotionally charged karsevak hindus who are devotees of Prabhu Shri Ram destroyed the disputed structure illegally with force.It did not become a local issue.It divided hindus and muslims in India.BJP lost elections in Uttar Pradesh for decades after this incident.India lost deep assets in Pakistan who helped us for covert operations.Demolition of the disputed structure is a wound that would take lot of time to heal.One side celebrates as Shourya divas and the other as Black Day.More than 25 years went away.Past is past.Hope that muslims and hindus would sit and talk.That would help in starting the construction of a bhavya ram mandir at Ayodhya.We have to settle this issue amicably so that both sides win and move forward as one nation. Maneesh presuming to be impartial but openly supporting the the wrong side!You are clearly siding with right wing hinuvatha forces! I hadbeen there in ayodhya way back in early eightees and spoken to a few people. Interestingly the local population was least bothered about it. As time progressed, changing socio -politic fabric of right wing forces cleverly used religion and rituals to have a foot hold. And they succeeded. But maneesh like u an young guy must analyse the deep impact it made in our socio economic front. The damage it caused is deeper than heard and seen. Religion and gods which are not bothering the down trodden is to be of what use? And the actual beneficiaries are the creaters of this calculated play are sitting behind the curtain and smiling... They are the corporates! !You are nicely enforcing the rightwing's view! And wisely evading socio economic impact of this calamity ! !anyway, we are on parallel track! Thanks for your observations.I was always on the right side and never of the left.I respect your viewpoint that would call it the wrong side which I do not subscribe to.I supported the hindu cause of Ram temple at Ayodhya since childhood.But only when I was adult, I was aware of more facts of the incident.In light of that I believe the demolition done by mob of people illegally was wrong.It did more harm to the perception of the movement which ought to be a noble cause.I don't believe in the revolution brought by mob of people.I better believe in the constitution, judiciary, rule of law and would advocate the use of them rightly to achieve the cause of rama temple. 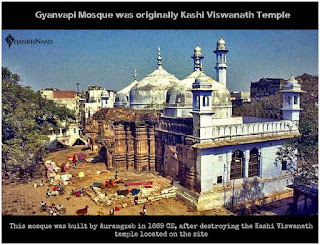 Also my conviction is that the temple should be built on consensus and no blood should be wasted for temple.Lot of mosques and temples got destroyed after the incident.It is a fact.Since my conviction is that muslims too oppose the acts of babar to demolish the temple, they would support the cause.They (muslims and secular hindus) object to Ram Temple largely because of politics and alienation as well as appeasement.You missed to read between the lines.I pointed fingers at the left liberal politicians who missed the boat to solve the communal problem by building a temple at the birth place which hindus believed to be of prabhu Shri Ram and rebuilding a mosque for muslims in a way so that both are in a win win situation instead of choosing sides and allowing the issue to get politicised.They were in power for a very long period.They could not solve it like Somnath temple was solved.Because those folks hated the hindus and were focused on hurting the hindu sentiments alone.I would say the seculars having a mental disease pushed the hindus to the ultra right wing and made them demolish the disputed structure on their own hand.It was bad management of the issue.Religion and gods do provide mental relief and comfort to common man.According to Islam, it is a sin to build masjid on stolen land as well as not right to destroy the places of worship of others.Also Babur is not a religious figure in Islam.Muslims often demolish mosques in Saudi Arabia when a road is being widened or for other reasons.They would have no problem in understanding the sentiments of their hindu brothers as well as in shifting the mosque if they are properly compensated and taken in to confidence.So they will definitely agree for resolving the issue.The only people who are against it are the secular anti hindu groups who do not want peace or the ones who view ram temple as hindu revivalism.They take an open step against the temple.It became controversial and communal issue so that many indian people got killed in communal riots that happened after a mob of emotionally charged karsevak hindus who are devotees of Prabhu Shri Ram destroyed the disputed structure illegally with force.It did not become a local issue.It divided hindus and muslims in India.BJP lost elections in Uttar Pradesh for decades after this incident.India lost deep assets in Pakistan who helped us for covert operations.Demolition of the disputed structure is a wound that would take lot of time to heal.One side celebrates as Shourya divas and the other as Black Day.More than 25 years went away.Patel and KM Munshi solved Somnath and reconstructed temple with the blessings of Mahatma gandhi.We need stalwarts who can solve issues and avoid riots.Do you think Prabhu Sri ram would condone communal riots in the name of him? 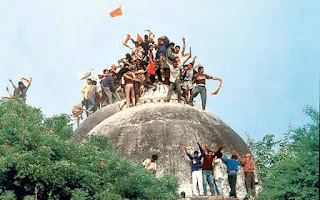 It should be noted that young muslim youths are pushed to terrorism using the narrative that includes demolition of disputed structure.If it is about taking sides,I was already in the side of Ram temple since I can remember.But that does not mean that situation was not handled well by anyone.The stand of BJP as well as congress politicians were irresponsible.100s of temples in Kashmir are destroyed and the trend is being continued almost everyday.Why it does not have an impact in the psyche and only the mob destroying barbarian babar's building become prominent image in the society? Diplomatic post.Becoming terrorist for any reason is not an excuse...If that's the reason then the country would have been an hindu taliban long back.